An end to fighting in Kosovo. A withdrawal of all Yugoslav troops and Serb special police. The safe return of all refugees. The installation of a NATO-led peacekeeping force to protect returning refugees. The creation of an interim administration for the province. The eventual autonomy of Kosovo within Yugoslavia. A formula for the economic redevelopment and stabilization of the province. BELGRADE, Yugoslavia (CNN) -- Yugoslav President Slobodan Milosevic has accepted the terms of an international peace plan for Kosovo, Finland's president told European officials Thursday. Finnish President Martti Ahtisaari -- the European Union's envoy to Yugoslavia -- told EU leaders in Cologne, Germany, that Milosevic agreed to the peace plan, which Serbia's parliament voted to accept earlier in the day. Ahtisaari is expected to report to EU heads of government Thursday evening after returning from talks in Belgrade with Milosevic and Russian envoy Viktor Chernomyrdin. Finnish diplomatic sources relayed word of Milosevic's acceptance to EU officials Thursday. NATO officials expressed cautious optimism, but said air raids would continue until Yugoslavia begins to implement the peace plan, including the withdrawal of troops from Kosovo. In Moscow, Russian officials said NATO military representatives could be going to Belgrade under U.N. auspices in a matter of days to begin implementing the agreement. Their arrival in Belgrade would bring an end to the 72-day NATO bombardment of Yugoslavia. News of Milosevic's agreement came shortly after Serbia's parliament voted to accept the European, Russian and U.S.- backed proposal, which includes a full withdrawal of Yugoslav troops from Kosovo and a "fundamental" role for NATO troops in a peacekeeping force there. The vote followed more than two months of bombardment by NATO air forces aimed at forcing Milosevic -- now charged with war crimes by a U.N. tribunal -- to make peace in Kosovo, a province of Yugoslavia's dominant Serbian republic. The plan includes an international security presence to ensure the safe return of hundreds of thousands of ethnic Albanian refugees and a troop withdrawal in Kosovo, where NATO says the Yugoslav army has carried out a campaign of repression against civilians. The Serbian parliament adopted the proposal amid contentious debate, with delegates coming close to fistfights at some points. On March 23, that body rejected NATO's peace formula for Kosovo, and the alliance began its military action the next day. As Yugoslav leaders deliberated, there were no immediate reports of NATO strikes around Belgrade. But scattered bombing in other parts of Yugoslavia was reported overnight. European and American officials reacted cautiously to the Serbian parliament vote. At NATO headquarters in Brussels, Belgium, allied officials said their operations would not change until Yugoslavia complies with all terms. In Washington, White House officials greeted the news with caution, saying it is "way too soon" to halt NATO airstrikes. In London, British Foreign Secretary Robin Cook said the vote "is not enough in itself" to stop the bombing, "but it's a very encouraging step." Bombing would stop only when NATO sees evidence that Yugoslavia has begun to implement the plan's terms, he said. "If that is what Belgrade accepts, then we do have a good basis for securing the objectives of our campaign," Cook said. Sticking points have included the makeup of the peacekeeping contingent in Kosovo: Yugoslavia insisted it be under United Nations control, while NATO held out for a force under its command. While the parliament took up the proposal Thursday, Ahtisaari and Chernomyrdin attempted to persuade Milosevic to accept the plan and end the conflict. 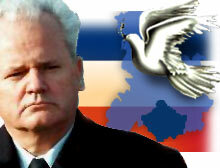 Their meeting marked the first direct talks by a Western diplomat with Milosevic since the NATO bombings began. The talks lasted about 90 minutes, with Ahtisaari leaving first and Chernomyrdin staying behind for further discussions. The plan under discussion in Belgrade was drawn up under principles agreed to in early May by the Group of Eight nations, which include the seven major industrial powers and Russia. Last week, Yugoslavia announced it accepted the "general principles" of the G-8 plan. The Yugoslavs also fought NATO's demand for a total pullback of its 40,000-strong army in Kosovo. Correspondents Walter Rodgers, Anchors & Reporters, Matthew Chance and John King contributed to this report.